Like economic phenomena, economics is itself unstable in its development process. 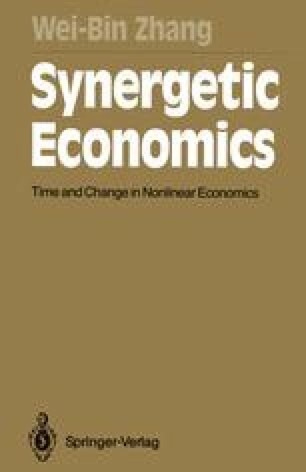 Synergetic economics is obviously located in a series of evolutionary orders of economic analysis. In his Foundations of Economic Anylsis, Paul A. Samuelson broadly classified the development of analytical economics into five steps. First, in Walras we have the final culmination of the notation of determinateness of equilibrium on the statical level. Pareto and others took a second step which laid the basis of a theory of comparative statics. The third step, which is characterized by maximizing action within an economic unit, was carried out by Johnson, Slutsky, Hicks, Allen and other economists. The fourth advance is due to the discovery of the correspondence principle. “A natural fifth step to take after we have investigated the response of a system to change in given parameters is to investigate its behavior as a result of the passage of time”. Furthermore, Samuelson emphasized that “The usefulness of any theoretical structure lies in the light which it throws upon the way economic variables will change when there is a change in some datum or parameter. This commonplace holds as well in the realm of dynamics as in statics. It is a logical next step, therefore, to begin to create a theory of comparative dynamics. This will include the theory of comparative statics as a special case, and indeed all of the earlier five subjects, but it will cover a much richer terrain”. Obviously, this fifth step has been cultivated in this book. Many people a passionate hatred of abstraction, chiefly, I think, because of its intellectual difficulty; but as they do not wish to give this reason they invent all sorts of other that sound grand.… Those who argue in this way are in fact concerned with matters quite other than those that concern science.